If you're expecting twins or know someone who is, you have to put a lot of thought behind prepping your nursery. And one thing that stumps a lot of mommies-to-be is the whole monitor situation. Do you buy one for the nursery? Or, should each baby have their own? This was the question my girlfriend posed to me when she let me know she was expecting twins. So, I decided to do some research to help her (and you!) out. 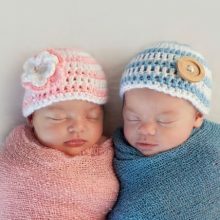 Read on to learn about how you can get double the peace of mind and which is the best baby monitor for twins that you should have in your nursery. If you're planning on keeping both babies in the same nursery, you can get away with one monitor. There are many awesome monitors on the market that allow you to scan around the room to see which baby is crying or at peace. If you are planning on using separate rooms, I highly suggest having a monitor in each room. To not have one in each becomes a safety issue. Moms mainly separate their twins so they can establish uninterrupted sleep patterns. And, it helps both parents take responsibility of a baby overnight. #1. Price. Monitors can get really expensive (especially if you are planning on buying two). You can get a wonderful monitor for just under $200. You get what you pay for, so skip the $50 monitors and invest in something that is going to last and give you a high performance. #2. Battery life. Let’s be honest: some days you’ll barely remember to brush your teeth, let alone charge your monitor. You want something that can last all day without being plugged in! #3. Invisible night vision. To ensure total peace of mind, you need to be able to see your babies overnight. Night vision is a must so you can see who is crying and know why. #4. Durability. You're going to drop your monitor. A lot! I can’t even tell you how many times mine slipped out of my hands, or how often my son grabbed it on the way out of the nursery. You want something that can survive falls and will still function fabulously. The Infant Optics DXR-8 (click here to check the price on Amazon) is a must have monitor if you are keeping both of your babies in the same room. This model allows you to get a panoramic view, so you can see all areas of your nursery. You can actually make it move horizontally and/or vertically as needed. Think of it as a “robot” monitor. It's also very high tech because it has different lenses that you can use and switch between. I’ve never come across a monitor like that, which allows you to check out any angle and even zoom in. You do have to purchase the wide angle lens separately, but I do think it is important to have. The monitor itself displays in color and has a large screen on a sleek, portable unit. It also has a battery life of about 10 hours, which is excellent for a monitor (but expect about 6 hours if you plan to keep the screen on constantly). I’ve also never come across a monitor that you can plug into virtually anywhere (or even get a beeping warning when the battery is getting low). It’s priced pretty reasonably in my opinion for such an important item. You do get a product that's very durable, high quality, and high functioning. The DXR-8 also allows you to view your baby clearly with its night vision display. You can keep tabs on the temperature of the area surrounding your baby (this is important for SIDS-related concerns), and when your little one gets older, it allows you to communicate through the device and vice versa (a must during potty training days). All in all, this is a wonderful product. If you are planning on keeping your babies in separate rooms, you can purchase up to four additional cameras (click here to check the price on Amazon) for the DXR-8. Financially, it just makes sense. Why go out and purchase an entirely different unit, when you can have such a great and effective product that can also accommodate separate cameras? With the add-on camera, you can switch back and forth between rooms on the DXR-8’s large viewing screen as often as you need. The add-on units are an exact replica of what comes with the original set described above and again, the extra lens has to be purchased separately. You’ll notice that both cameras get great image quality because they are made out of multi-layered glass pieces. An added bonus? For a small price, you can pay for a two-year protection in case any kind of fluke accident occurs to your items. This is our pick for the best video monitor for twins on the market. Motorola’s video baby monitor with double cameras (click here to check the price on Amazon) is essential for moms to own if they are bringing twins home from the hospital. With an extra baby in tow, there’s more to see, more to monitor, but most importantly, there’s more to love. You can gain a clear view of your babies during the day on its large, color screen. Feel free to pan, zoom, and tilt to gain the best view of your baby, all by using the parent unit. The monitor runs on wireless access, and has about a 600 foot range so you don’t have to camp out near the monitor during the day. If your babies are fretting, you'll also love that you can play up to five lullabies to try to soothe them first, before going in the nursery to readjust them. At night, you can gain a clear view, thanks to Motorola’s technology, and you can also view its infrared night vision sound level indicator. The system is designed with a high sensitive microphone, which can be controlled easily, and is also loud and clear enough to hear from a distance. The battery comes with adapters and a rechargeable pack so you can make sure your monitor is always ready to go. You'll love that a low battery alert sounds when you need to be reminded to recharge (because you already have enough on their mind!). You'll also love that it gages temperature, so if you feel your babies are too hot or too cold, you can quickly adjust the thermostat to ensure your little ones stay fast asleep! The Summer Infant Dual-View monitors (click here to check the price on Amazon) are just what moms with multiples need. You don’t just need to see one baby, but both, at various times throughout the day (after all, it’s not a perfect world-each baby won’t always have the same sleep schedule). So, you get two cameras so you can zoom in on each little angle, whether they sleep in the same room or not. The cameras allow you to zoom in, rather than walk in the nursery to check in on their sleeping angles. You also gain night vision, and sound activated LED lights, which you'll love for evening use. It also boasts a slit screen view, so if both of your babies are on the same nap schedule but snooze in different rooms, you'll never have to guess who’s crying, where, or why. With a range of up to 600 feet, you'll have the freedom and flexibility to move freely on all levels of your home (or if you're moving too far away, an out of range indicator will be activated). The monitor’s batteries are also rechargeable, but can be placed on automatic power save mode, which makes it last much longer. Volume is adjustable, as is brightness, which can be helpful when monitoring overnight. The monitor’s camera is small enough to be placed on a dresser or nightstand, or it can be mounted on the wall. You can clip the monitor on while your babies are napping, or utilize its kick stand while cooking, for a hands free experience, yet total peace of mind that your bundle of joy is resting peacefully and safely. So, now you know where I stand on which is the best baby monitor for twins. With the Infant Optics DXR-8, you only need one unit and an add-on camera (or two) to help you take care of your babies and have complete peace of mind when they aren’t with you. Trust me. You deserve a great night’s sleep, so rest you shall with such a great device in your nursery!